Made of premium plastic, the MicroStar Purple Award is finished in a shiny metallic purple coating. The MicroStar Purple Trophy stands on a single tiered black marble base. The centrepiece rises up through a V shape frame into a large purple star at the top. Affordable and youngsters will love it. 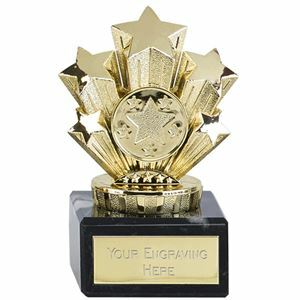 The Mini Magnetic Star Award is an award with a difference which shows a large embossed star with three smaller shooting stars in the background. 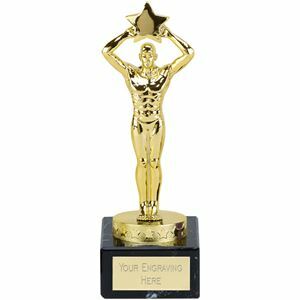 The award offers the option of personalisation with a FREE engraving text plate. This award is cast from superior grade resin, glazed in two toned gold and is magnetic - attachable to magnetic surfaces only. Affordable enough to award all the players in the team. In gleaming gold, a victory torch holds up a circular motif that displays a full colour image of a football and football boots on a green pitch. The smaller size 566A takes a 20mm premium (self adhesive) vinyl insert image, while the larger size 565A takes a 50mm image. The Budget Football Achievement Trophy is mounted on a solid black marble base which can take a FREE personalised engraving plate. Made from premium resin and coated for a high shine finish, the Micro Star Trophy is versatile for use at any event. 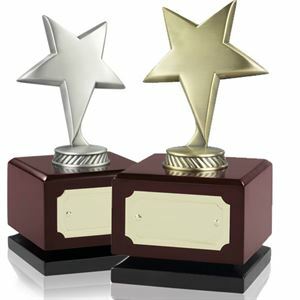 The trophy stands on a rectangular base, with fan styled riser and displays a large bright gold star as the centrepiece. 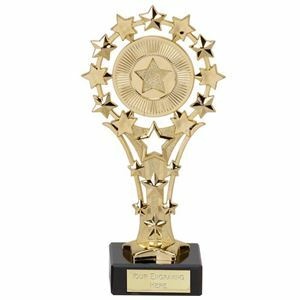 The Star Achievement Trophy is a premium quality sports or business award made from high quality glossy gold glazed plastic. The male figure top trophy is displayed holding a gold star above its head. The resin body stands on a black solid marble base, which can also hold an engraved plate. Excellent value. 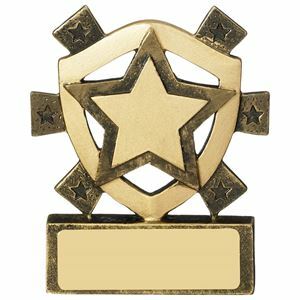 Reward all your star performers with this beautifully moulded quality resin award. The Star Mini Shield features a bold gold star set within a shield frame that is decorated with smaller stars and is mounted on a small base that can take a FREE engraving for that personal touch. Great price. Featured on a die-cut shield, the Smiley Star Mini Shield displays a smiling golden star and smaller stars beaming out of the shield. 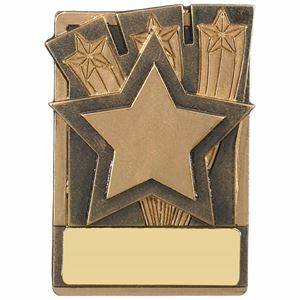 Ideal little award to reward all the star performers in your class, club or team. This award is made from high grade resin and varnished in glossy gold and antique gold.